In their study, authors Stan Davis and Charisse L. Nixon, PhD, add youth voices to the national debate about bullying and peer mistreatment. Youth Voice Project offers an analysis of findings from their survey of more than 13,000 students across 31 schools in the United States—plus suggestions for meaningful change based on students’ responses. 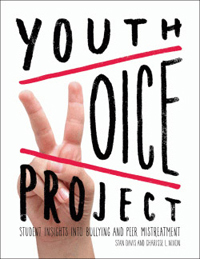 Youth Voice Project includes an overview of the project’s rationale and methodology, a description of the characteristics and impact of peer mistreatment, and an analysis of the effectiveness of various types of response to peer mistreatment. Bridging the gap between research and practice, the text offers direction for educators, administrators, parents, and others concerned about bullying. Conclusions focus on ways to make schools safe, inclusive, and supportive environments for learning. For more information, visit YouthVoiceProject.com.